DIDJYA KNOW… Mike sings, plays guitar and writes music and poetry. He produces the music of the Dirty Sock Funtime Band, including the CDs SOCK-A-DELIC, THE DIRTY SOCKS COME CLEAN, and THE SPIN CYCLE EP. 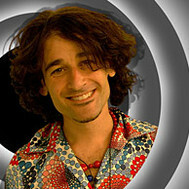 He produced and performed the theme to “LORDS OF THE PLAYGROUND” which has been viewed over 1.5 million times online. Mike is also the voice of “Dad” in the cartoon “Sing It, Laurie” on Sprout. Mike lives on a tiny island off the coast of America called Manhattan, with a cat named Lenny Valentino, who you can hear on the song “Lenny”. He writes all of his songs on an acoustic guitar named Rosebud, which was given to him by his best friend Ryan. He can play guitar, bass, harmonica, a little bit of piano and an FM radio. Every day he plays a concert for kids SOMEWHERE! When he’s not doing that, he’s on tour somewhere playing music for grownups. Like the song says, when Mike was just a little boy, he discovered the power of noise, so he formed a band – with his brother Ron – and started writing songs… all of this when he was eight years old. The band was called the STAR BROTHERS, and their recordings are rare and difficult to find. His sister is an artist, one of his brothers is a magician, and another is a producer of television and documentary films. Mike was once a guest star on Sesame Street, playing guitar with Big Bird, and it was the best feeling in the world. He’s a photographer and has had his photos printed in the New York Times, The New York Post, Variety, and Time Out NY. He learned music from his friends, and went to Carnegie Mellon University, and got himself a BFA in drama. He also studied at the British American Drama Academy in Oxford, England. Mike has had a really fun life travelling around the world, performing and making people feel good not just in the USA but also in Switzerand, Germany, Holland, Luxembourg, Panama, Mexico, Lebanon, Cuba, Bahrain, Japan, Italy, Guam, Spain and Greece, just to name a few. (If you can, visit other countries, it’s maybe the best thing you can do) He had the honor of touring and singing alongside the late great Billy Preston, and was blessed to have been a part of theater legend Tom O’Horgan’s creative world. He painted the guitar in the “I Feel Trageriffic” video by himself, by hand. He designed a recording studio that he built into his apartment. The teddy bear that you see in the videos and in pictures is Mike’s teddy bear (he’s from Holland and his name is George, but nobody ever calls him that). Today, Mike is at home in New York City, but has also lived in Los Angeles, Amsterdam, Black Rock City and Pittsburgh but originally comes from Rockland, NY, where all the ROCK comes from. Mike thinks that you should always be free to express yourself. © 2013 Dirty Sock Funtime Band, Inc.